Even when the tarot reading isn’t particularly negative, creating a tarot mandala after the reading is a great way to reinforce the divination. To change the prognosticated negative outcome revealed by the card reading, I can create a tarot mandala. First, scan the reading to see if there are any positive cards you want to pull in to your mandala because those are energies you want to reinforce. If yes, include those cards in your mandala. If there are positive cards you want to include in the mandala, give each one of those positive cards an ally, i.e., find another card in the tarot deck that can in some way energetically support or be an ally to that positive card. Second, identify the negative cards you want to change. In the case of the hypothetical five-card reading shown, I’m going to change all five. Decide which card can represent an antidote, counter, or strong enough block to the negative card. You can work with elemental dignities, the mathematical weight of numerology, or whatever method makes the most sense to you. You can even bring in another deck of cards, such as an oracle deck. To counteract The Destroyer (Ten of Swords), I went with The Joyous One (Ten of Chalices/Cups). For the Tower, I went with The Healer (Key 17: The Star). For the Three of Swords, I opted for the Eight of Orbs, to endow me with what I will need for the hard work it takes to change my circumstances, to embody the Journeyman and remind myself that the power rests in my own two hands. Then for the Ace of Swords that appeared in reverse, I rectify it, make an intentional show to myself of turning it upright, and keep the upright Ace of Swords in my mandala. To the Five of Chalices/Cups, I opted for The Dark Horse (Seven of Scepters/Wands) to defeat the energies of the Five of Chalices, again, as a way to remind myself that I have all the strength needed to defeat oppositional forces. Then arrange your selected cards into a mandala formation, working with some of the tips and instructions covered in the video. You’ll really want to amp up the personal creativity here. For the mandala, I like to mix and match with oracle cards. 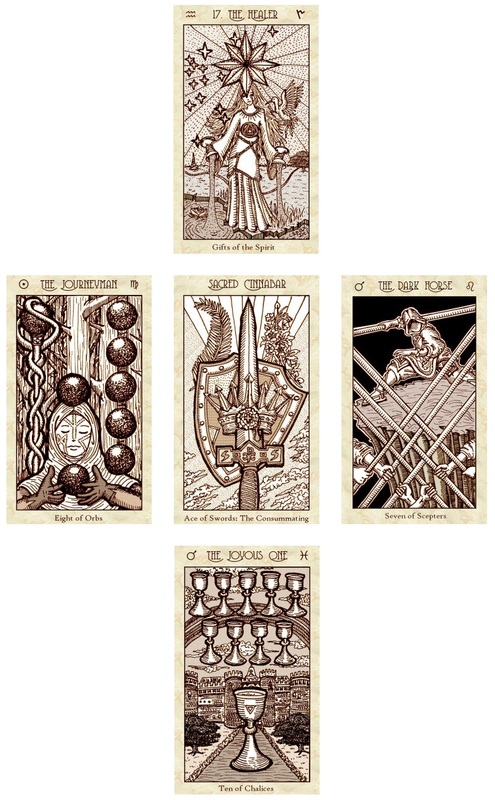 Above you’ll see I’ve cast a circle around my five selected tarot cards, using the Chinese oracle bone script divination deck. 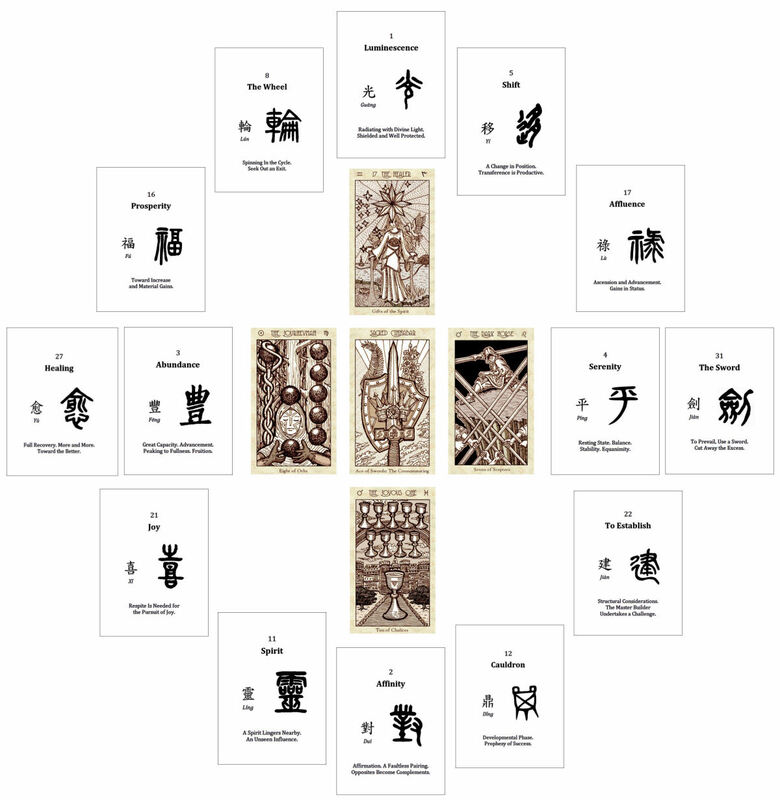 You can download the formatted digital files of the Chinese oracle bone script divination deck for free, over on the Tao of Craft Downloads Page or just see below. Note: There are a few minor typographical and formatting errors in the card image files that need correcting. If you would like to print the files into an oracle deck, be sure to go through each card first and copyedit the files prior to your printing. Click on banner to download zip file. Contained in the zipped folder are JPG image files you can totally play around with, redecorate, change up, do as you will, and then print your final designed deck. There’s also a companion guidebook in PDF format to help you work with the oracle bone script. For your personal, non-commercial, and spiritual uses, feel absolutely free to do as you will with the basic files provided. Add your own art, add any art that speaks to you, add borders, change up the coloring, formatting, arrangement of information on each card face, I mean you go do you! For reals! A future episode of Sightsee the Tarot, currently scheduled for May 18, “The Tarot Keys of Your Birthday (Tarot and Astrology, 1941),” will include a supplemental reference on calendar date correspondences in the tarot per the decan rulers. You can select a tarot card based on its date correspondence and use that card in your tarot mandala to manifest an outcome during a specific period of time. How neat is that! If you can’t wait, then the same timing correspondence information can be found in Tarot Correspondences (2018) by T. Susan Chang (read my book review of it here). Spread This, Witches will be hosting both Rachel Pollack and Mary K. Greer for an incredible, not-to-be-missed online conference and interview session with these two queens of tarot. Click below for more details. This July, 2019 in Rhineback, New York will be the Masters of the Tarot conference at the Omega Institute, headlining both Mary Greer and Rachel Pollack. I’ll also be one of the speakers, along with Michelle Tea and Terry Iacuzzo. Check out the details of the conference by clicking on the banner below!